Human: Dante is taller than most, though he lacks strength. His hair is more of a light brown, his eyes are a light amber, and his complexion is pale. Wolf: Dante's wolf form tends to stretch from his human form ; His pelt is a light purple, but has pitch black stripes running through it. His eyes are a deep magenta. Human: Eos is about average height, and a bit underweight [not for long x3]. Her hair is pitch black, her bangs highlighted with red. Her eyes are a deep crimson. 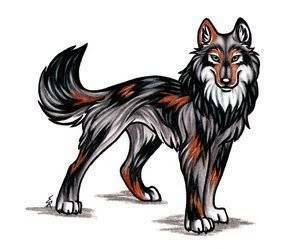 Wolf: Eos's wolf form doesn't change much ; Her pelt is a deep black, with red paws, chest, and underbelly, as well as deep maroon eyes. Wolf: Derrington's wolf form is the same ; A darker blonde pelt with sky blue eyes, though one his front paws are silver. Dante snarled, "I wasn't asking for your opinion, and I don't think I said please." He then flicked his tail, and charged, aiming to knock James off Ama from his shoulder. James growls, and crouches, to avoid the attack, and springs back up immediately. "I'm stronger, and smarter than you. Face it," He growls at Dante. Ama smiles, and kicks James in the ribs, and starts struggling more. "Your not getting up, Ama," James hisses. Ann jumps out of the bushes, and knocks James onto the ground. "Now she is. You are offically castout from the Fallen Trees. Under these terms, you are not allowed to join a pack, within a 10000 mile radius," She hisses. Ama gets to her feet slowly, and shakes her head at James. "I thought we were friends," She whispers, and runs off, going further from the pack Territory. James rolls his eyes. "I'm so scared. And I'd be careful, Ann. I will come back," He growls, and walks into the bushes. At that point, Derrington burst through the bushes, tumbling over himself. He got up, and shook his pelt, "I heard yelping, is everything okay?" Dante turned, "Everything is fine, beach bum." He smirked softly, then went back to a serious, yet soft face. Derrington snorted then sat down. "She'll be fine, for a few days. After that, she normally stops running and starts to try and think about what happened. That's how its always been," Ann whispers, staring at the way her sister had gone. Dante sighed, and shook his head, "Life isn't fair, sometimes." Ann nods. "I agree. But we can't let the difficulties stop us. Your temporary leader while she's away, you'll take over her responsibilities," She whispers, and starts back for her territory. Derrington burst out laughing, "I can already feel the empending doom, you'll turn this place into a dictatorship." Dante snorted, "Shut-up, and come on." He then turned back for Icy Fates territory. Ann rolls her eyes, and disappears into the bushes. Ama continues to run, her ears back, and her eyes shut. I refuse to accept that he would do that. James wouldn't hurt me. James wouldn't hurt me. She thinks, over and over, trying to believe it. She felt her pace waver, and then picked it up, not wanting to turn back and face what had happened. Dante walked by Derrington's side, snorting again, "Your an idiot, you know." Derrington sneered, "And your a wimp, you know." Ama stops for a few seconds, breathing deeply, before she takes off at top speed, her paws blurring in a whirl of motion. Dante sneered back, "Shut up, beach bum." Derrington narrowed his eyes, but kept quiet. Ama keeps her eyes closed, beyond the things that had troubled her. She breathed easily for the first time in a long time, letting go of the tight bounds she held around herself. She howled, a long melodious sound, one that she hadn't heard herself produce since before her mother died. She continued to run at her full speed as she howled, only pausing to drag in long breaths. Derrington watched Dante, then sighed. Ama stopped running abruptly, hearing a sound in the trees. She started to run at the fastest speed she could, trying to ignore the sound, and think of something peaceful, as old memories flooded her mind, making her steps falter, and her howl waver. Dante kept his ears pinned, actually hoping he would go deaf. Ama stops howling, hearing the sound increase. She looked around, listening closely, and smiles, imagining her mother's voice. Dante perked his ears back up, but left his right ear cropped. Ama walks toward the bushes slowly, following the sound of her mother's voice. But she stops halfway there, hearing her conscience kick in. Don't. It's a trap. She heard it say, and backed away from the bushes, taking off toward the horizon. Dante finally made it back to the pack house, and pushed open the door with his muzzle. Ama continues to run, picking up her pace as she did so. James growls as Ama ignores the recording of her mother. She always relies on her instincts. He thought and followed her silently. Dante quickly jumped up on the chair, and put his head on his paws, but didn't plan on sleeping. Ama stops, and sighs. I can't abandon my pack. She thinks, and with that singular thought, turns around. She ran back for the Icy Fates territory. Dante sighed, watching the door, hoping Ama would walk through it. When Ama reaches the territory, she closes her eyes for a few seconds, before padding toward the door, ready for anything. Dante immediatly shifted, then quickly got up, wrapping his arms around her in a tight hug, saying absoultly nothing. Ama looks at Dante calmly and sighs. She puts her arms around him gently, closing her eyes. Dante just held her there, he truely didn't want to let go, but he knew he would have to eventually. Ama opens her eyes. "I was gone for like, an hour. Not a year, Dante," She whispers. Dante whispered softly, "Just worried.. You seemed really upset." He then sighed, and let her go, letting his arms drop back to his sides. Ama shrugs. "I was, but I got over it," she replies. Dante sighed again, then shifted, going back to his spot on the chair. Ama jumps up beside him, and puts her head on his shoulders. "Never said I wanted you to let go," she whispers. Dante laughed softly, then put his head on his paws. Ama crosses her paws and yawns widely. "Running through the woods at full speed is tiring," She whispers. Ama giggles quietly. "I love you and all, Dante, but your not as soft as my pillow," She whispers, and jumps off the chair. "I'm going up to my room," She adds, and trots up the stairs. Dante laughed softly, "Good night, but I think I'd rather stay here." Ama looks down from the top of the stairs. "Have fun, don't let the pizza monsters eat you," She giggles, and jumps toward her room.